When it’s compromised, the whole structure is bound to experience problems. One good example that shows the interrelationship between a foundation and other parts of the house is the roof. When the foundation is damaged, chances are the roof is also damaged (or at least in the process of getting damaged). That’s why it pays to regularly check the condition of your home’s foundation. Because, by caring for your foundation, you’ll also be caring for other important structural components such as the roof. 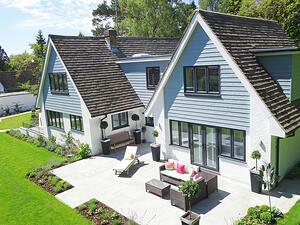 Fixing a damaged roof can be among the costliest of home maintenance expenses. A damaged roof can cause leaks, decrease your home’s value or even collapse. Water damage is among the most common causes of foundation damage. Water is the number one enemy in expansive soils problems. Poor drainage may affect expansive clay soils. Expansive clay soils expand when in contact with water and shrink when not. This constant expansion and contraction is what leads to foundation problems and consequently roof damage. Undercutting of the foundation also relates to poor drainage. Basically, this is when water washes away part of the soil supporting the foundation. Over time, this causes one part of the foundation to become weak, leading to foundation and roof problems. Trees with extensive root systems can also cause foundation issues that will in turn cause roof damage. Common trees with invasive root systems include Silver Maple, American Elm, Willows, and Hybrid Poplars, to name a few. 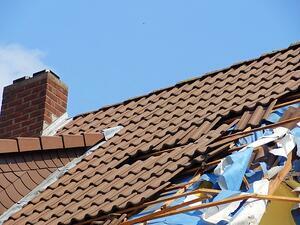 Yes, roofs can also get damaged by falling or rubbing branches. However, unknown to many people, the most damage comes from beneath – from the roots! Trees are always looking for moisture and nutrients in the soil. In areas with expansive clay soil, the soil particles shrink when the tree roots draw moisture from them. Over time, this shrinking causes the foundation to shrink. When the foundation shrinks, the roof also begins to experience problems. It may look humpy, saggy or wavy. 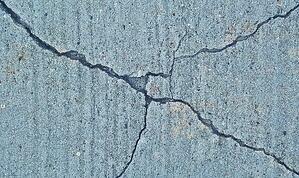 One common sign of foundation damage is the appearance of cracks on the surface. Oftentimes, foundation cracks occur because of soil movement. With sufficient movement, not only will the foundation fail, but also the roof will begin to show problems. Not all cracks are created equal, though. Some are more serious than others. Generally speaking, there are four types of foundation cracks. You can see these on the wall’s exterior above the foundation. They are a result of differential settling. If they extend through the blocks or if the block is displaced, it could mean a serious foundation problem. However, if the cracks are only in the mortar joints between the brick or block, the problem is usually not serious. These are typical in concrete block and brick foundations. They run sideways and are the most serious of cracks. In most cases, horizontal cracks are caused by a bowing foundation. This is one that runs from about 30 to 75 degrees from vertical on the wall. Usually, diagonal cracks occur as a result of uneven settling. That is, one part settles lower into the ground while the other one stays fully supported. These are not a real structural concern. Most houses will experience them in the first couple of years after construction. They occur because concrete is very strong under compression but cracks easily under tension. When foundation cracking is severe, roof damage will often occur. In some cases, the roof will look bowed. Foundations or foundation and slabs ideally should be level. Unfortunately, many are not. They could’ve moved or could’ve been constructed that way from the beginning. To test whether your floor is level or not, you’ll need a tennis ball. On a level floor, the ball obviously won’t roll. If put on a misaligned floor though, the ball will move. The faster it moves, the worse the underlying problem. Doors that are unable to open or close properly may also indicate the foundation isn’t level. Foundation movement may also cause roof damage. Typically, foundations move in two ways, either by settling or by heaving. Foundation settlement is usually the first sign of more serious foundation damage. Early signs include tilting chimneys, jamming doors, sticky doors and wall cracks. Foundation heaving is when your foundation or concrete slab floor moves in an upward direction. This movement can cause the floor and wall to crack. Generally speaking, if your foundation moves, then so does your roof! So, ensure your foundation is regularly evaluated and when needed, repaired. This way, you’ll be able to avoid unnecessary and costly repairs. This guest blog post was kindly written for us by Granite Foundation Repair https://www.granitefoundationrepair.com/.